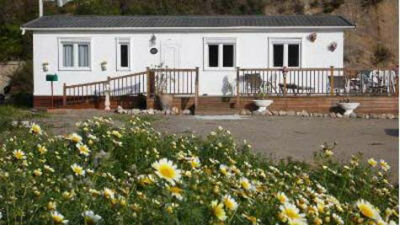 This is a well presented chalet offering the peace and quiet of the countryside, but still only 5 minutes drive away from Nerja. It has three good size bedrooms, two bathrooms, separate dining room, plenty of space outside and a large inflated private pool. Enter the chalet through a neat hallway into a large light airy lounge with 2 comfortable sofas, good quality furnishings and satellite T.V. The separate kitchen is fully fitted with dishwasher, ceramic hob, double oven and integral microwave, all brand new. A lovely little hallway leads to a bright dining room with pristine white dining table and chairs. Full size double French windows lead to the patio. 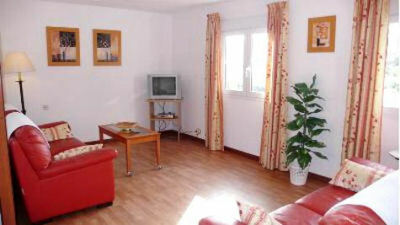 There is also a separate room which houses the washing machine and an extra fridge. The master bedroom is of very good size with double bed, drawers, bedside table and lights, fitted dressing table type unit and fitted mirrored wardrobes. The ensuite bathroom has a modern vanity unit with a cabinet and mirror, wash hand basin, shower with a screen, w.c and bidet. Bedroom two has twin bed with bedside tables and lights. The fitted wardrobe with mirrored doors has hanging and drawer space. The family bathroom has a small bath with a shower over having a fully enclosed screen, w.c. and modern vanity unit with wash hand basin, and large mirror. Bedroom three has a double bed with bed side tables and lights, drawers, fitted wardrobes and a unit with shelves and a large mirror. Outside there is a lovely large decked patio around two sides of the chalet. On one side there are reclining chairs and a marble top coffee table, and a marble top dining table with 6 chairs. On the other side there are sun loungers. There are several plants adorning the patio from which there are a few steps taking you to a large gravel area with a pathway leading to a good size round inflated pool, which has a fully working pump, and steps. There are views to the sea and the mountains and a pretty rockery. This chalet offers you the chance to have a budget holiday but to enjoy the facilities of much more expensive properties.